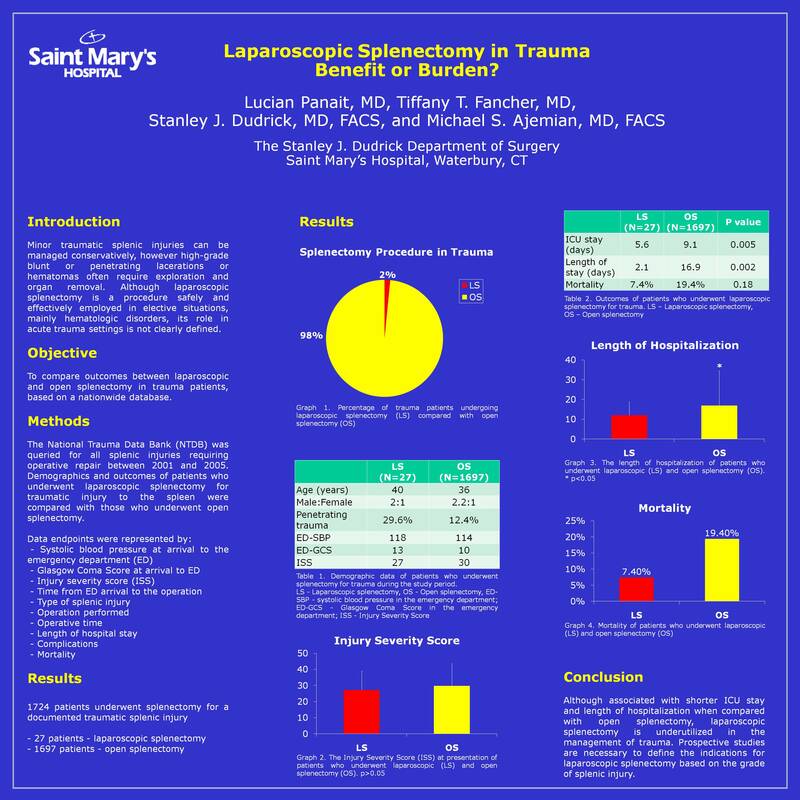 Laparoscopic Splenectomy in Trauma: Benefit or Burden? Introduction: Laparoscopic splenectomy is a safe and effective procedure in elective situations, however it is rarely employed in acute trauma settings. The objective of this study was to compare outcomes between laparoscopic and open splenectomy in trauma patients, based on a nationwide database. Methods: The National Trauma Data Bank (NTDB) was queried for all splenic injuries requiring operative repair between 2001 and 2005. Demographics and outcomes of patients who underwent laparoscopic splenectomy for traumatic injury to the spleen were compared with those who underwent open splenectomy. Data endpoints were represented by: systolic blood pressure and Glasgow Coma Score at arrival to the emergency department (ED), injury severity score (ISS), time from ED arrival to the operation, type of splenic injury, operation performed, operative time, length of hospital stay, complications and mortality. Results: Of the 1724 patients who underwent splenectomy for a documented splenic injury, 27 patients had a laparoscopic procedure and 1697 underwent an open procedure. The average patient age was 40 years in the laparoscopic group and 36 years in the open group, with a male:female distribution of 2:1 and 2.2:1, respectively. Penetrating trauma represented 29.6% in the laparoscopic group and 12.4% in the open group. Mortality rates after splenectomy were 7.4% in the laparoscopy groups and 19.4% in the open group. The patients who survived had a significantly shorter average ICU stay in the laparoscopic group compared to the open group (5.6 vs. 9.1 days, p<0.05) and a shorter length of hospitalization (2.1 vs. 16.9 days, p<0.05). Conclusions: Although associated with shorter ICU stay and length of hospitalization when compared with open splenectomy, laparoscopic splenectomy is underutilized in the management of trauma. Prospective studies are necessary to define the indications for laparoscopic splenectomy based on the grade of splenic injury.